15-MINUTE READ · By Supermetrics. Supermetrics is excited to release a powerful “Russian duo” – the Yandex.Metrica and Yandex.Direct connectors. With these two new integrations you can take full control of analyzing and reporting marketing data from Yandex – the biggest local search engine in Russia. Below I will discuss what metrics you can report from Yandex.Metrica and Direct, what are the reporting UI limitations on each platform and how you can improve your Yandex reporting with Supermetrics for Google Sheets, as well as Metrica and Direct connectors for Google Data Studio. In addition, you will get a bunch of useful Data Studio and Google Sheets’ reporting templates along the way, which simplify both Metrica and Direct data-crunching and visualization. Metrica is a free analytics tool, which allows to measure your website traffic. Just like Google Analytics, it provides insight into your website visitors’ behavior. Yandex.Metrica offers two data analysis options for its users: the Dashboard section where you can get a general overview of your metrics, and the Reports section where you can view and build more detailed reports. However, the reporting user interface is not perfect: it has some shortcomings in terms of digging deeper into the data and visualizing it. The Dashboard section provides a general overview of your key metrics, visualized with the help of the addable widgets. 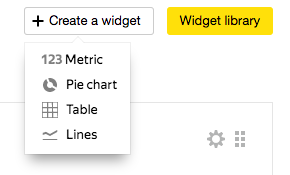 However, the widgets there can only be showcased with 4 types of graphs: metric scorecard, table, sparkline or pie chart. In the Reports’ section, you can see dashboards with pre-set metrics and dimensions. In addition, you can create your own custom reports. The main drawback of this section is that you can view only one custom report at a time: in order to get the “full picture” you will need to switch between different pages. 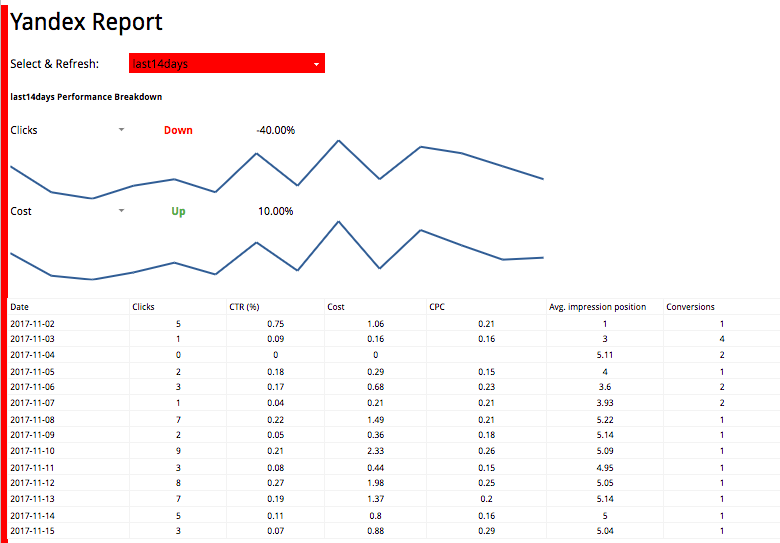 Supermetrics for Google Sheets and Google Data Studio allow you to improve your Yandex reporting by putting all the data you need in a single-page report. Yandex.Metrica is a great tool for analysis, yet it does not provide an option for multi-channel reporting. In order to compare Metrica’s data with data frоm other networks, you need to export it to a spreadsheet. One common example of such comparison is Yandex.Metrica vs. Google Analytics. By looking at the data from two different platforms side by side you can easily spot the differences, which improves data accuracy. Firstly, Supermetrics Add-on’s sidebar makes it extremely easy to pull and sort Metrica data and split one or more metrics by the dimension(s) of your choice: with just a few clicks you can get the top-10 last significant traffic sources and the corresponding numbers of users per each source. After that, you can pull more data on the last year’s traffic sources, split by month, and get data on the most popular landing page for each traffic source. Next, with the help of formulas you can effortlessly pull all the data into one chart: in the example above, a 12 months’ trend of the number of sessions per traffic source is shown and the corresponding top landing page is mentioned as well. Google Sheets’ formulas provide you the freedom of data management – after the metrics and dimensions are pulled with Supermetrics, the possibilities of analyzing them and extracting the needed insights are endless. Another pain-point of the Yandex.Metrica reporting UI is that neither the dashboard nor custom reports provide you the required overview and depth for a convenient day-to-day metrics monitoring. 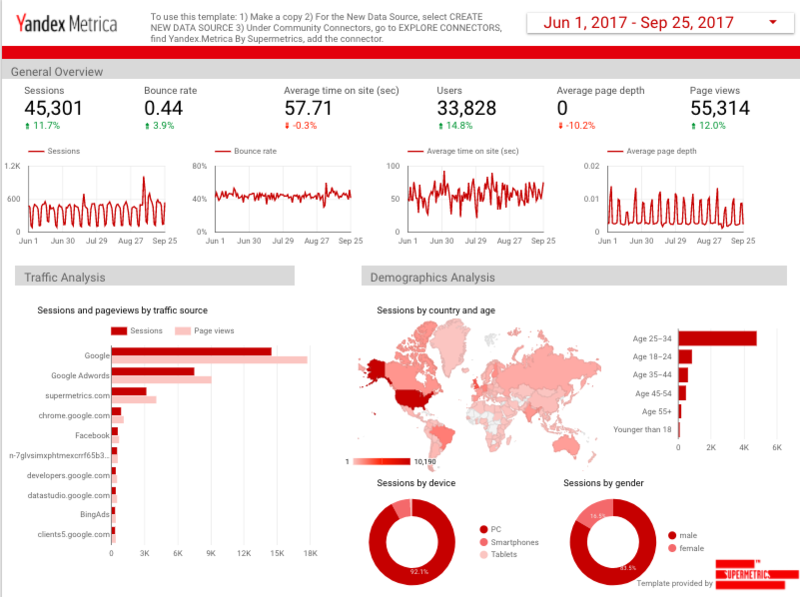 Reporting Metrica data with Supermetrics in Google Data Studio will make your life easier: a Data Studio dashboard allows you to get an overview of all the important metrics. You can also go granular: add multiple dimensions in a table and explore different graph options to customize each report the way you want. If you want to use this reporting template, click this link and follow the instructions in the template’s header. Yandex.Direct is a platform similar to Google AdWords: with this advertising service you can build and monitor search ads. Yandex.Direct’s reporting interface is less advanced than Metrica’s – it does not provide the dashboard, which consists of widgets to help get a general overview on statistics, and does not allow one to build multiple detailed reports. This platform’s main way of providing detailed statistics is through its report wizard. In the report wizard, you can choose several metrics and split them by one or multiple dimensions. Just like in Metrica, you can save your custom reports in Yandex.Direct. But in order to view them you again have to switch between the tabs. You can avoid this issue by creating the report with Supermetrics in Google Sheets or Data Studio, where all the relevant charts can be viewed on a single page. Follow the article further to find out what is the benefit of viewing relevant Direct metrics in Google Data Studio and why it is useful to compare Yandex.Direct data with the data from other social networks. 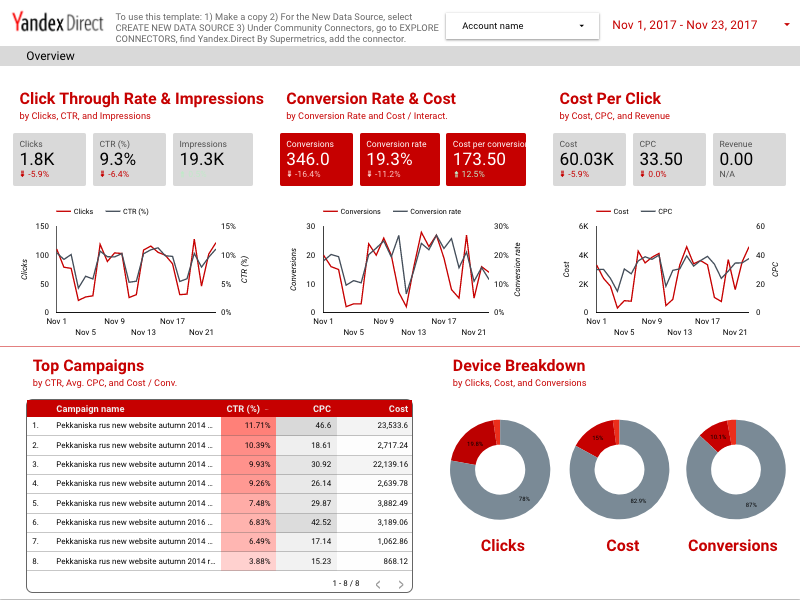 Supermetrics makes it easy to pull Yandex.Direct data into Google Data Studio, so you have all the metrics and dimensions you need in one place. A Data Studio Yandex.Direct dashboard will give you a great overview on the relevant statistics: you can build scorecards with the main metrics and trendlines to see how those key metrics change with time. You can also, for example, easily break such metrics as CTR, CPC and Cost by campaign. In addition, you can do the device type breakdown. Another great feature of Supermetrics connector for Data Studio is that it allows to report data from multiple Yandex.Direct accounts . To choose which accounts you would like to pull data from, simply create a drop-down menu with an “account” dimension and choose the relevant account from the drop-down. If you would like to get the template featured in the example click here and follow the instructions in the header of the file. It is a common scenario that marketers run ads on a number of different platforms apart from Yandex.Direct: this provides a better coverage and more conversions. In order to maximize the ROI of such approach you have to have an insightful report in place. In order to see and use the report featured in this example, click here . Follow the instructions in the file’s upper right corner on how to get this template from Supermetrics Google Sheets’ template gallery. Yandex.Metrica and Yandex.Direct can be connected: this way you can easily see Metrica data in Direct and vice versa. However, the number of available metrics and dimensions is very limited. In Yandex.Direct, you can only report bounce rate, bounces, sessions and average pageviews as website metrics while in Metrica only clicks and cost data can be reported. The solution is to use both Yandex.Metrica and Yandex.Direct connectors together to pull data from both sources: this way you can build charts like in the aforementioned examples and compile a nice-looking dashboard with multiple metrics. Yandex.Metrica and Yandex.Direct are key platforms when it comes to doing marketing in Russia. Both tools’ native reporting UI’s have their own drawbacks: you cannot perform in-depth analysis or nicely visualize all the key statistics in a same report. Supermetrics helps solve these issues: you can easily crunch Metrica and Direct data in Google Sheets and build beautiful visualizations with the data from both platforms in Google Data Studio. 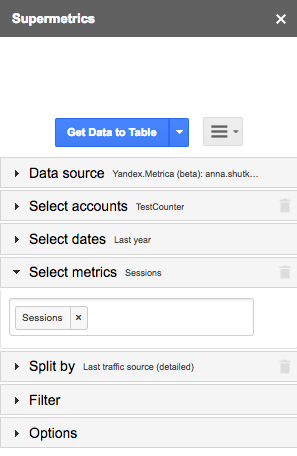 Give them a spin today in Google Sheets or try out Yandex.Metrica and Yandex.Direct connectors for Google Data Studio. As always, we’d love to hear your feedback!